I was warned, before entering the ice cave, that I would have to crouch. Being on the short side, I smiled at the idea, confident that the advice was aimed at the taller members of our group. Armed an icepick, I felt appropriately adventurous, and excited to be ticking off another dream from my travel wish-list. The journey to the cave itself was thrilling, with our off-road vehicle juddering over rough, rocky terrain as it followed the passage carved out by the glacier. Completing the last leg of our journey on foot, we scrabbled across the bleak, alien landscape; as devoid of colour as a black and white photograph. When we finally arrived, it dawned on me that I would very much have to crouch, for the entrance was less of a cave, and more of a drainpipe for the meltwater that constantly dripped from its surface. Hunched over like elderly people, our icepicks became walking sticks as we shuffled anxiously into the unknown. 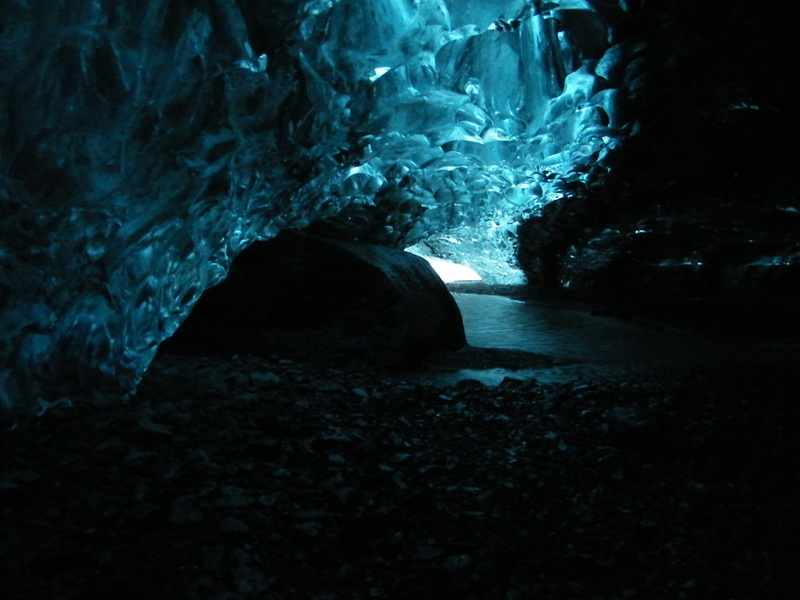 The crystal caves are named after the stunning blue radiance that seems to emanate from the icy walls. The effect is created by sunlight travelling through layers of ice packed so densely that they absorb or reflect all other colours in the spectrum. Shivering from the wet and cold, I sat huddled beneath this ethereal blue glow, taking a myriad of blurred photos that could do no justice to the otherworldly beauty around me. After several minutes spent squatting in the semi-darkness, the urge to stand-up drove me forward. Eventually, I emerged out the other side and into the daylight, like a diver resurfacing for a breath. Our guide was there waiting and pointed out fissures in the glacier, warning that the other caves nearby were too dangerous to enter. 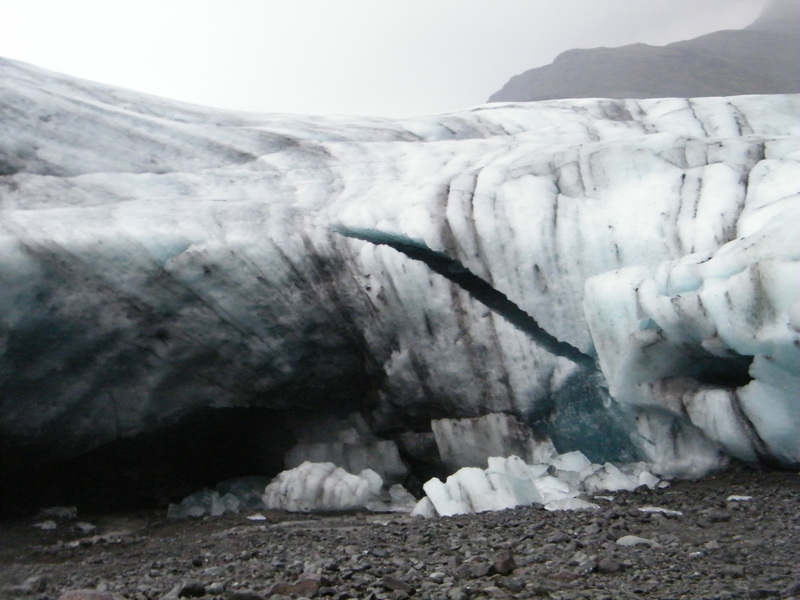 Each year the locations of suitable caves change as the glacial ice shifts, and I was soon reminded of just how risky this activity could be. Those of us who tried to get a closer view were given a stark warning to stay back, as a falling chunk could be enough to kill, helmet or no helmet. 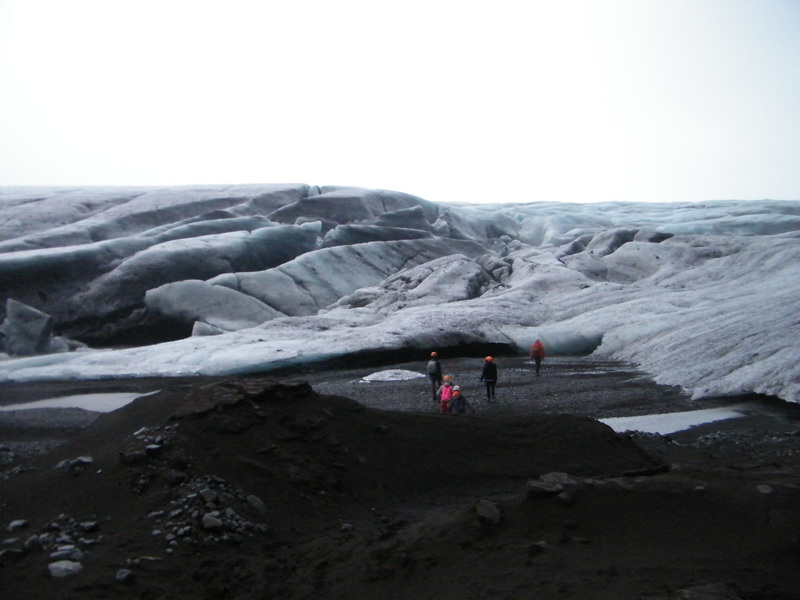 There was only one way out of the glacier, and so we turned back into the cave. Once I had crept through, I was thoroughly glad to have the open sky above my head instead of several tonnes of melting ice. Although the crystal caves were different to what I expected, they were nevertheless awe-inspiring and an exciting adventure for someone who prefers her adrenaline rush in small doses. If I ever find myself in Iceland again, I hope to be a better photographer, or at least, bring a better camera.